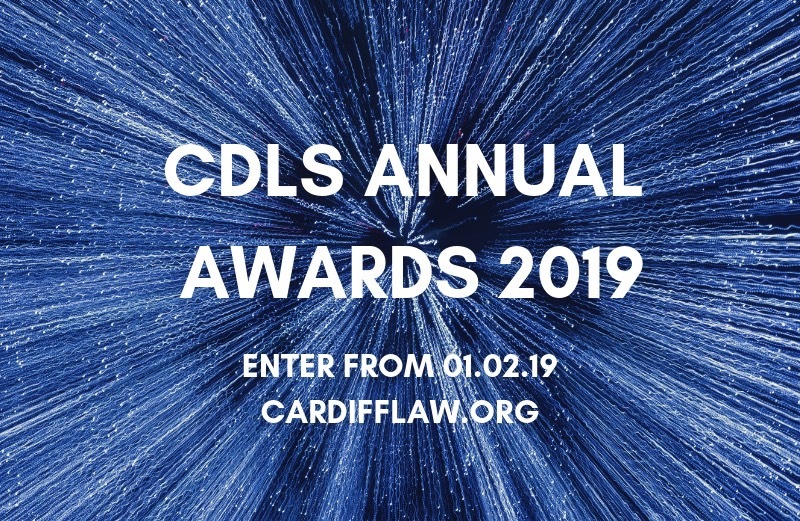 CDLS Legal Awards 2019 - News - Cardiff & District Law Society. NOMINATION DEADLINE 30 March 2019! Do you know a lawyer who has made an outstanding contribution to our local legal community, a Junior Solicitor who is one to watch or think your firm has showcased and evidence Excellence in Access to Justice? Then please nominate them for one of the Cardiff & District Law Society Annual Awards – announced at a glitzy ceremony at the CDLS Annual Dinner 2019 on 10 May at The Exchange Hotel, Cardiff Bay. The Law Society Excellence Awards 2019! As an added benefit of entering the CDLS Annual Legal Awards, we have partnered with the Law Society of England and Wales to give our winners access to the Law Society Excellence Awards passporting scheme. This scheme allows our award winners to be considered for related Law Society Excellence Awards categories, providing the criteria of the award category corresponds to the criteria of the selected Excellence Award categories. The winning entries will then be automatically put through to the longlist for the relevant Excellence Awards category. In previous years successful winners from regional law awards have gone on to win at the Law Society’s ceremony, such as Zoe Gascoyne from Liverpool Law Society, who beat off strong competition in the Solicitor of the Year – Private Practice category. We encourage you to enter our awards for this chance of further national recognition. NO other award event in Wales can offer this exciting opportunity to our members and we strongly encourage you to enter. This award celebrates an exceptional standard of work as well as great dedication to the role of a junior solicitor. The judges are looking for a solicitor who is excelling in their role or making a significant contribution to voluntary or pro-bono schemes. The winner will be going beyond what is expected of a junior solicitor and bringing insight, flair, imagination and hard work to everything they do. *Open to LPC students, LPC graduates (for example those working as a paralegal), trainee solicitors and solicitors with up to five years and 364 days post qualification experience as of 1 February 2019 - practicing within the Cardiff and District Law Society area. LPC students and LPC graduates who are shortlisted may be asked to provide confirmation of their LPC attainment. Access to justice is a fundamental right and legal aid performs a crucial role in providing fair and equal access to those most at risk of being excluded from our legal system. Ordinary people are finding it more difficult because of the growing gaps in the provision of services, so this award celebrates the teams and firms who go above and beyond to combat this issue. Using technology to improve access to justice. Delivering new services in advice deserts. Developing business models to provide effective and affordable services to those who need but cannot afford legal advice and representation. Applications are open to practitioners and firms practicing in the Cardiff & District area. The projects must benefit those in the Cardiff City and District area in addition to (if relevant to your project) other areas in Wales and England. area in recognition of his or her contribution to the Law and the legal profession. We encourage you to nominate persons for contributions at all levels and of any nature, to reflect the variety of ways in which Simon applied his endeavours to support and promote the law, the legal profession and those who serve it. Submissions should be sent in writing with a maximum wordcount of 1000 words, along with contact details. Please check the rules, procedure and eligibility requirements, listed below, before entering these awards. Nominations for these awards should be sent to the President, Clive Thomas via cthomas@watkinsandgunn.co.uk or by post to Clive Thomas, Watkins & Gunn, 46/48 Cardiff Rd, Llandaff, Cardiff CF5 2DT. Please provide as much information as possible to support the nomination. The awards will be judged by a panel comprising the President, Immediate Past President, Senior Vice President, Junior Vice President and Administrator of the Society. 1. Entries must be accompanied by a 50-word summary of your entry (for PR purposes). 2. The judges' decisions are final, and awards will be made at their discretion. Not all the awards advertised will be awarded if the judges consider that the criteria have not been met. Additional commendations may be made at the judges' discretion. 3. The content of any entry may be used for publicity purposes unless the entrant withholds their consent to this in writing. Content submitted online may be accessible publicly through our website. The content and its publication must therefore be lawful and not confidential. 4. Entrants will be deemed to have accepted these rules and procedures and to have agreed to be bound by them when entering this competition. 5. We regret that feedback cannot be provided on individual or team entries. 6. Any awards will be automatically rescinded in the event of the winner being struck off. You may nominate yourself/your own organisation or another individual/organisation. To be eligible to enter any of the individual awards, nominees must be on the roll of solicitors for England and Wales and practising, unless otherwise stated. Please read the criteria and specific entry requirements carefully. Submissions must relate to activities or initiatives conducted in the 12 months prior to 1 February 2019 (the month nominations open). The Awards will be presented at the CDLS Annual Dinner 2019 at The Exchange Hotel on Friday 10 May 2019.